Thread in 'Hardware' started by Report, 11 May 2016. Qlex, Burbruee, clincher and 2 others like this. So you're just going to stealth drop the fact that there's a Raspberry Pi port of Texmaster without hooking us up? K, JBroms and Tomek like this. That's pretty quiet alright. What's the premium for such convenience? What's the premium for such convenience? It should be roughly twice the price of a standard JLF. I sent the image file to the above three people in a direct message. - Fixed the initialization process. Cinnaminion, Kitaru and Burbruee like this. Write “2016-03-12-jessie-minibian.img” to Micro SD card. Insert micro SD card into Raspberry Pi. rpi1-ARMv6 -> standard build binary. rpi2-ARMv7 -> no input lag. not release in Japan. no check. Novomancy, Kitaru and Burbruee like this. Could this be added to the list of ports on RetroPie? Not a request, this is just to know if it's feasible. If so, this would be life changing. Good idea ! but, Does it work in RetroPie ? (1) LEFT switch & LED check. Switch on -> LED off -> on -> block move images. If you managed to make it work in minibian, I'm 90% sure it will work in RetroPie. It's just a matter of placing the right files at the right place. As far as I understand, "ports" in RetroPie are not emulated games. They are games installed on the device, similar to what you did with Texmaster on minibian. 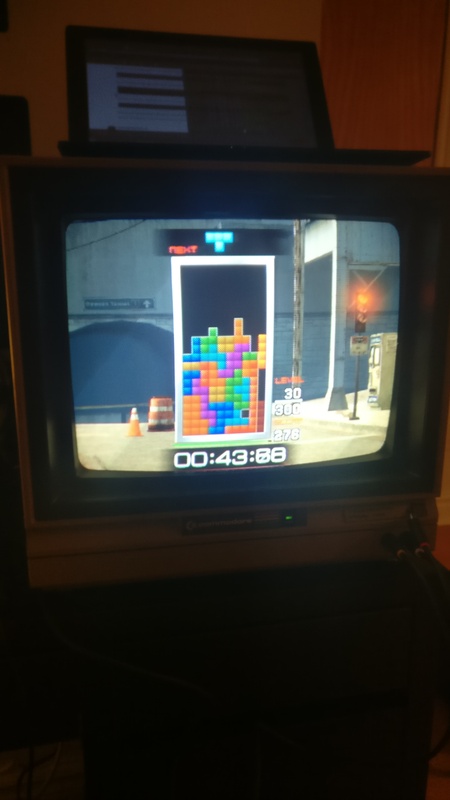 For example, there is a clone of Tetris already available called Openblok (I have no idea if it's good or not). I think what they did is contact the RetroPie administration and simply gave them an auto-install script for their game. RetroPie is NOT an OS (edited: thanks herb_fargus) with NO pre-installed games. It's raspbian with a script that installs emulators. You get a terminal just like in minibian. You could try installing RetroPie on a microSD card (similar to installing minibian, I imagine) and run Texmaster exactly like you did on minibian. I posted on the RetroPie forum to get some feedback from the RetroPie devs. They said they could not look into it right now, but I imagine if you contact them yourself it could help them speed up the process. P.S. You show Texmaster on Raspberry Pi works with the GPIO, but does it work with a USB stick? I'll try myself if I have time, but curious if you already know. Did you change the link? Hey I work on retropie. Retropie isn't an OS. It's just a script to install lots of different pieces of software. Raspbian is the OS. Also retropie doesn't ship with any games we especially dont ship with any that are copyrighted. I wouldn't mind giving the game a look when I can find some free time. Not sure if it needs X or not (retropie doesn't have a desktop environment by default), but if it's stictly SDL it should be doable. Thanks for the clarification, herb. Can't believe I wrote RetroPie shipped with games. I did get texmaster running on raspbian/retropie just fine and it's nice to have considering there isn't really a way to get good tgm on the pi. I just have one little nitpick. The only way to exit the game is via pressing escape on a keyboard. Most people using retropie don't generally keep a keyboard attached to their system. Could a quit menu option be added in somewhere (I'd prefer this one to avoid accidental quits) or the ability to remap how to quit the game to a controller?